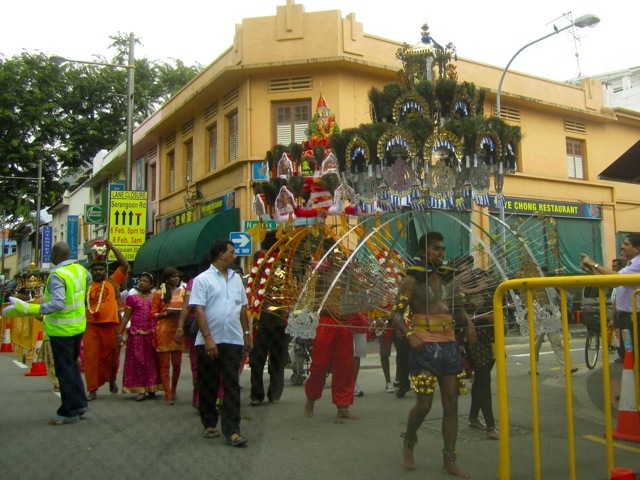 The yearly Thaipusam festival is very much part of my consciousness growing up. 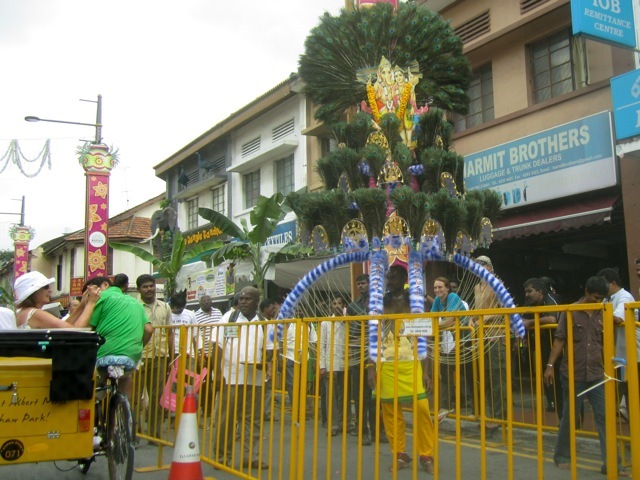 Used to watch the Hindu religious event as a kid. I always couldn’t look directly at the piercings then and it wowed me that faith made their pain non-existent and at the end of it they didn’t bleed. I still recall being told that holy ash was applied when the piercings were removed. 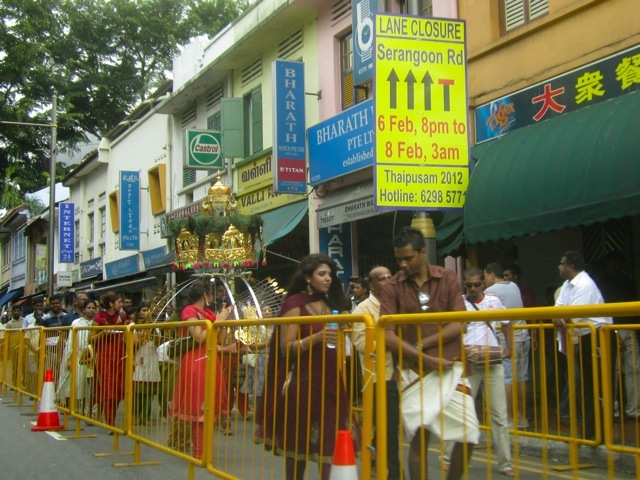 This year the procession which falls today on 7th February seems more subdued now with the road barriers and new rules against music being played loudly and such. 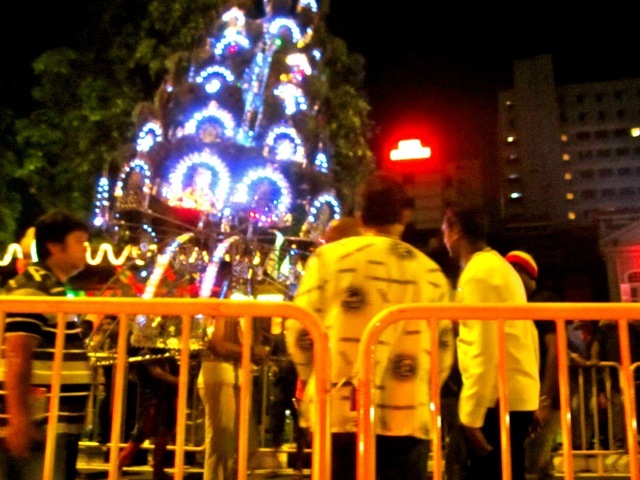 I felt bad taking photos while the devotees were undergoing their penance, but I just wanted to document the festival. Wish I had documented it back then when their were full road closures for the event and you could feel the spiritual energy. 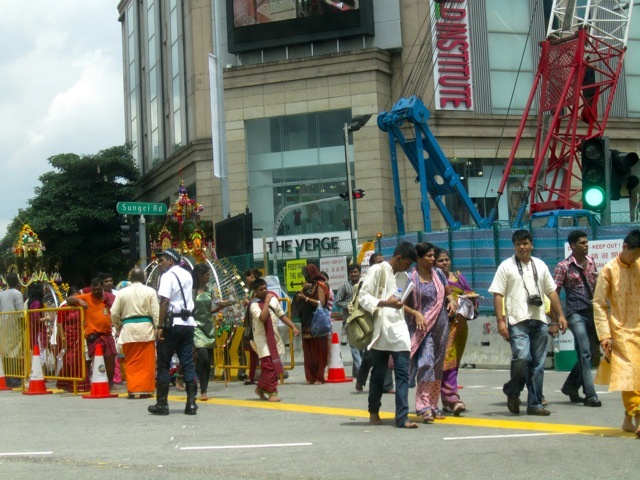 Women and other devotees who take part also carry the paal kudam (milk pot) and you can see them clothed in orange. 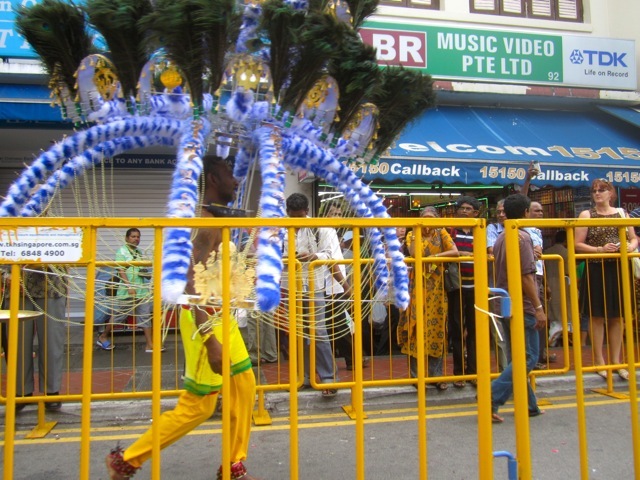 Children also have their heads shaved as part of the ritual. What we first saw in the morning. 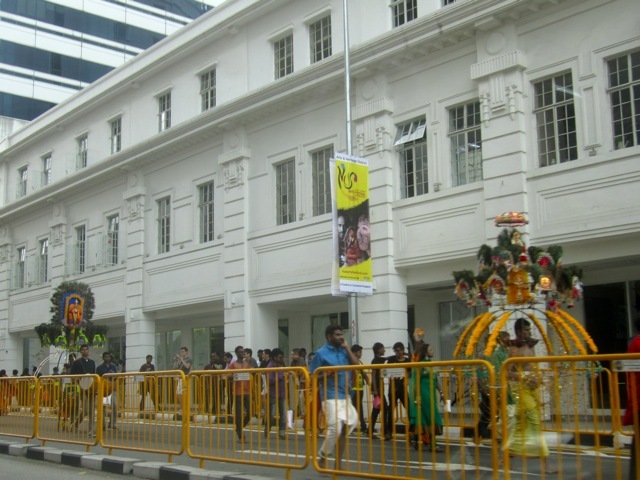 The procession from the nearby Tank Road Temple. 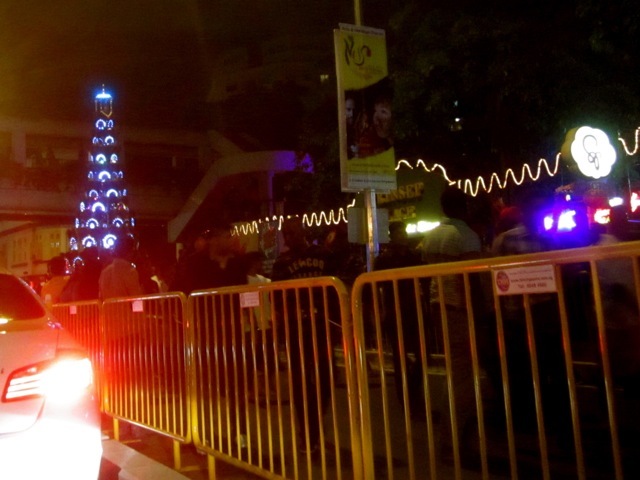 The police and volunteers had a massive job controlling the traffic. But everything went very smoothly. 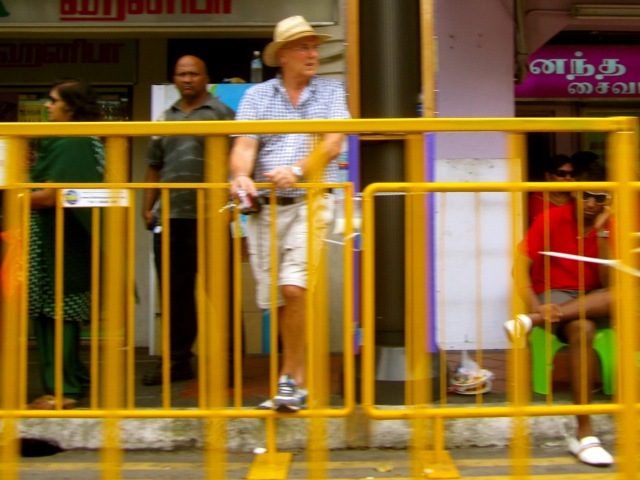 Very Singapore. 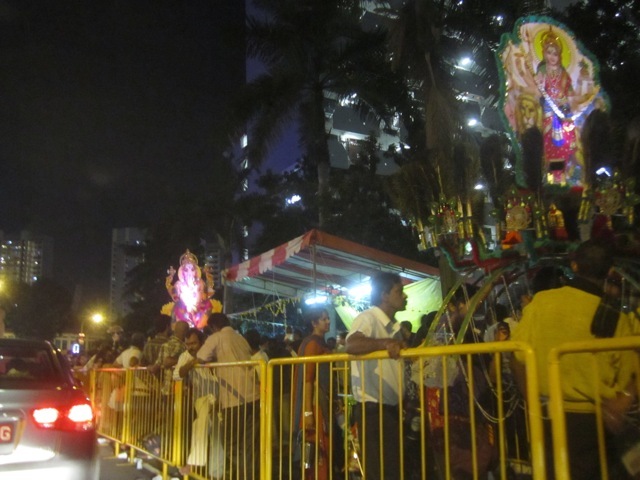 It was just a pity that devotees had to start and stop at every traffic light. In my mind I was thinking must have been hard with the heavy load and blazing sun. And then a bit later in the early afternoon. 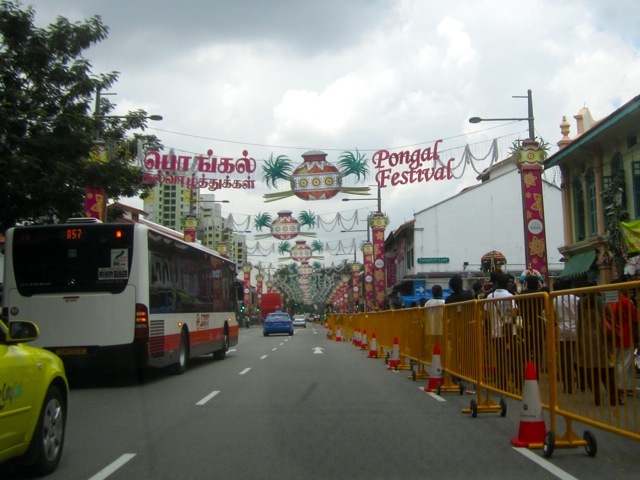 And Pongal or the Hindu Harvest Festival Decorations were still up at Little India. 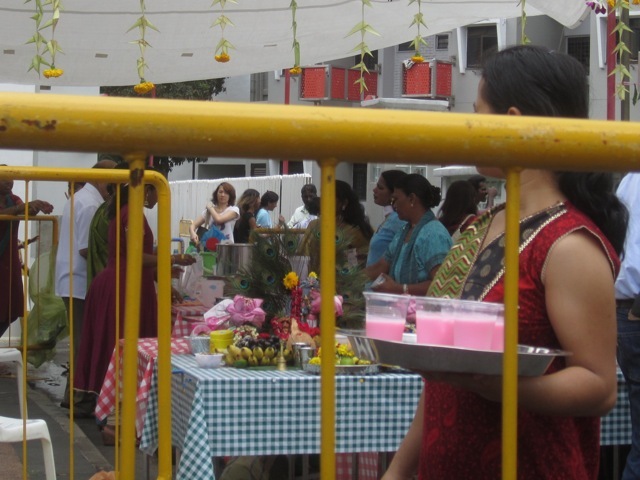 Lime juice and Bandung was served at the water points. Someone even offered us some. Felt a bit guilty taking it but they insisted warmly. 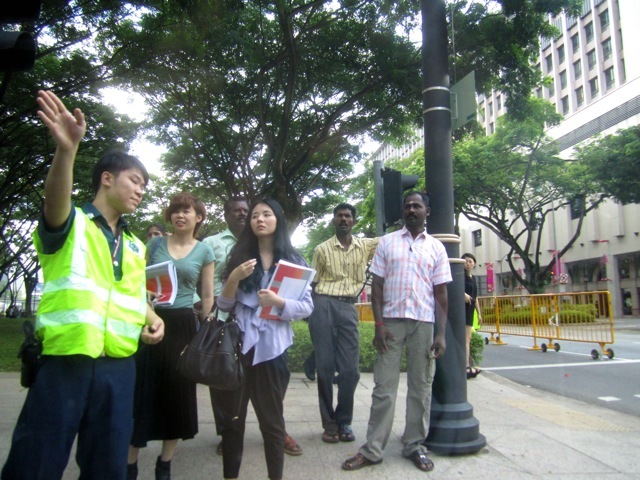 There were many fascinated tourists, residents and locals. 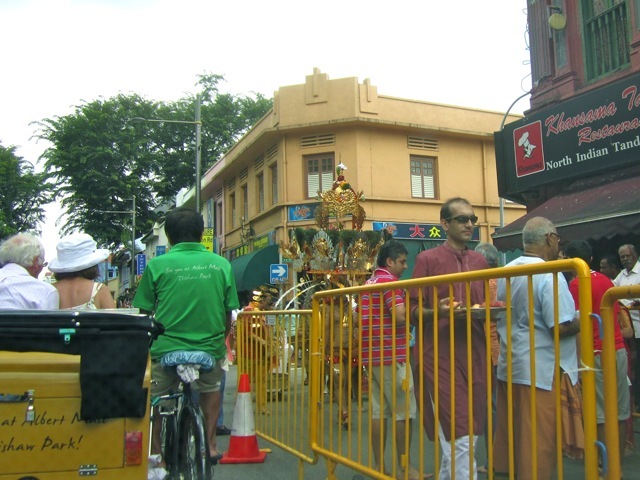 The view from the Rickshaw was good and the devotees obliged the photo takers. 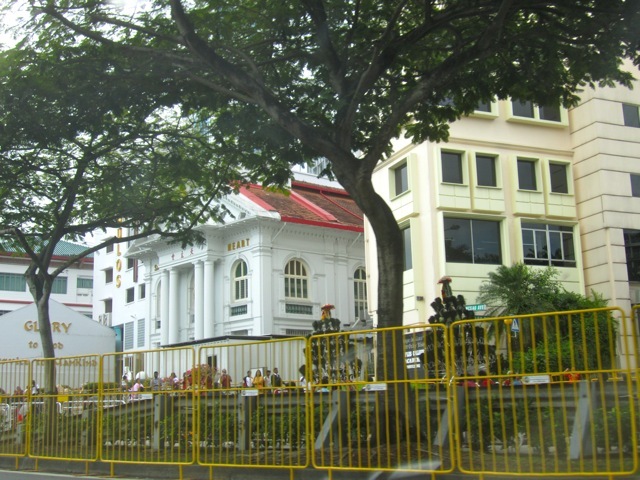 Part of the route including Prinsep Street. It got a bit harder to take the night shots. 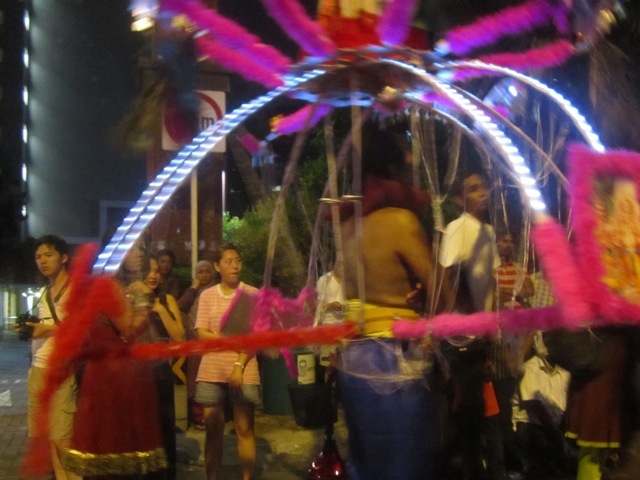 But it was quite stunning as many of the kavadis were lit up. They were very huge too. One of them seemed more than 4 m tall. It was quite amazing to see. 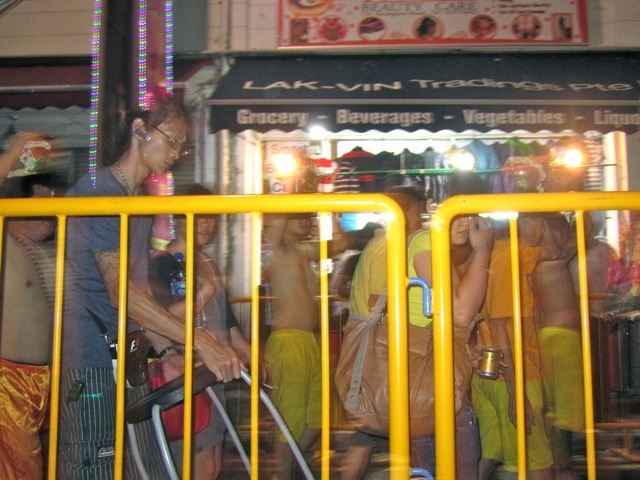 We saw Chinese devotees as well. 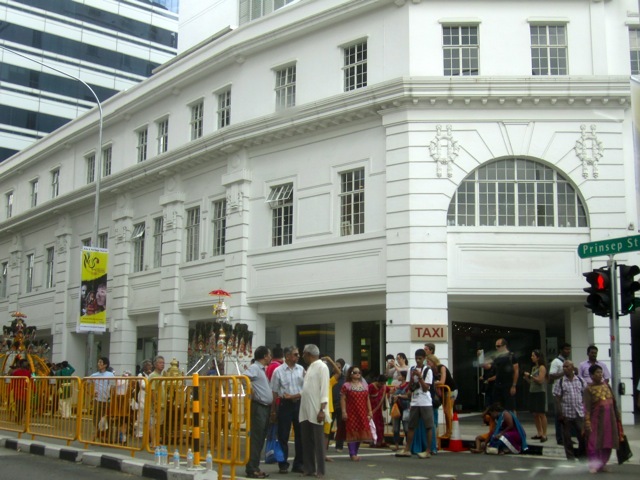 Just love the embracing of cultures, religions and how we all intermingle as Singaporeans. 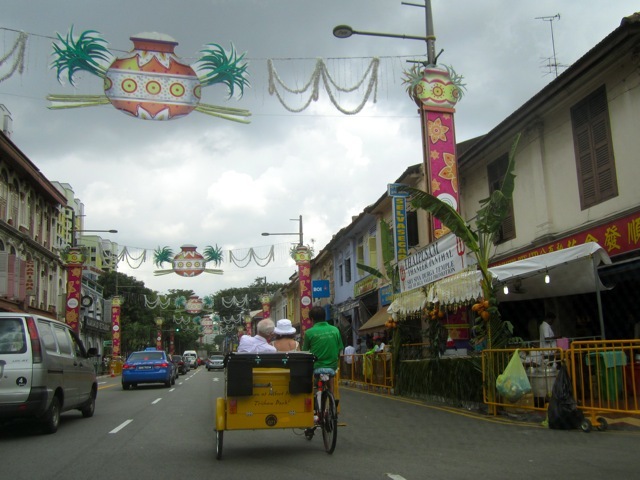 We really do take our religious tolerance for granted, but compared to other places the level of tolerance, understanding and harmony is pretty amazing here. 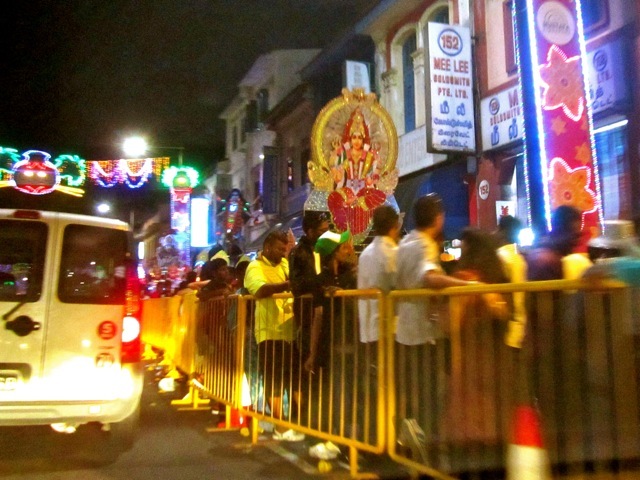 The walk from one temple to another is about 4km long and the procession goes on till 3am at night. 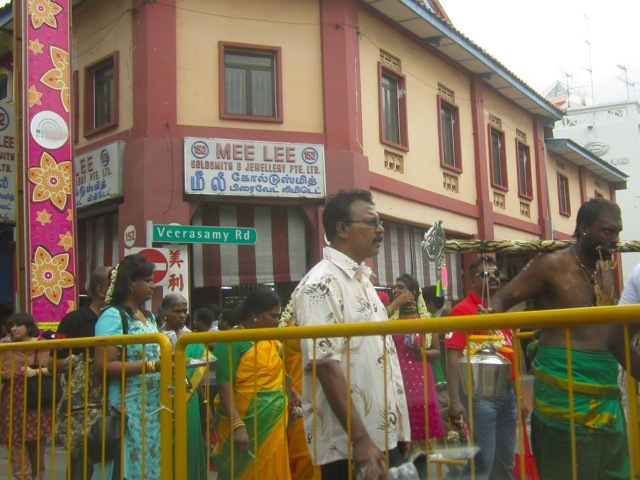 You must check out the amazing photography here where close-up scenes from the temple were captured. Was also amazed by the full moon out last night. 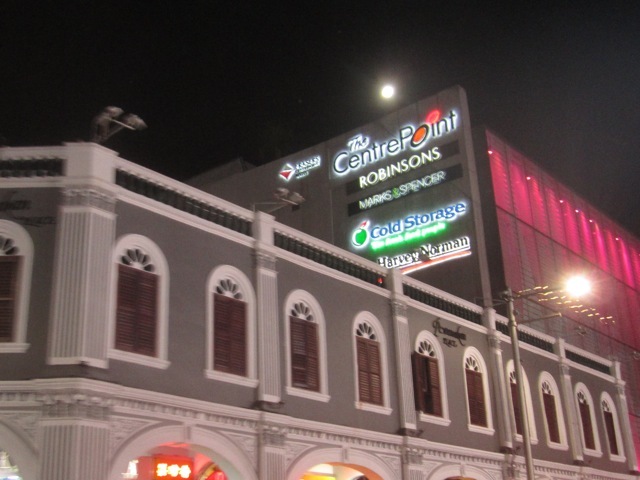 It was one night when we didn’t mind the inching traffic at all as we drove from Orchard Road to Serangoon Road. The pictures alone don’t tell the story so I had to include this video I found on YouTube. 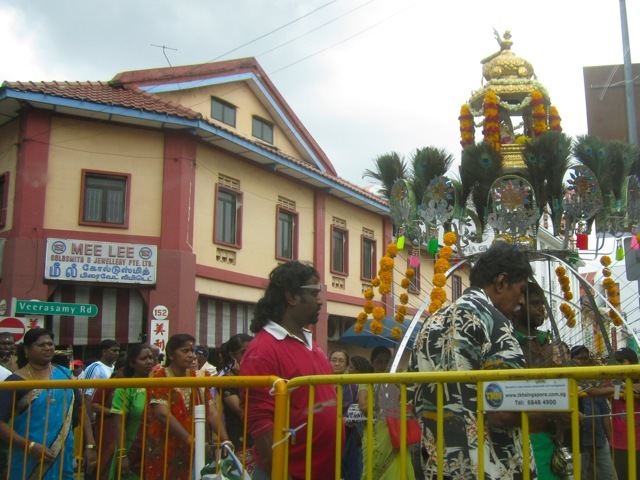 Drums, singing and the devotees constantly moving in rhythm while carrying the very heavy kavadi is a must see. 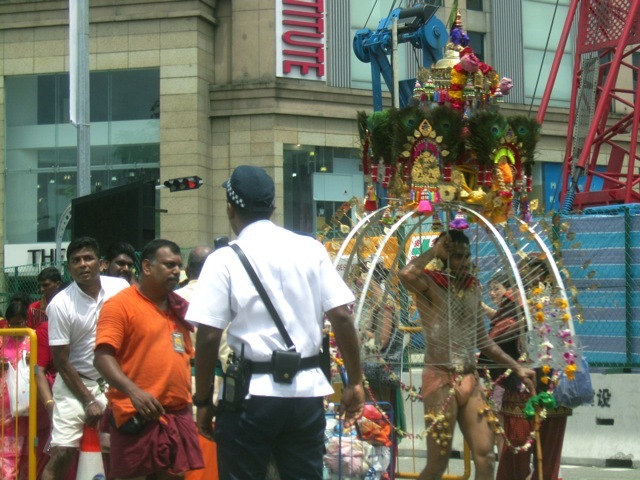 This entry was posted in Culture & Society and tagged culture, devotees, festival, hindu, Kavadi, penance, photos, ritual, Singapore, street scene, Thaipusam 2012, Video. Bookmark the permalink. Thanks for sharing your photos – sad to hear the celebrations have been toned down although it still made getting to work a bit tricky with the traffic jams. Nevertheless it was worth it! So glad you liked them Sarah. This festival always amazes me. It doesn’t seem possible that a human can accomplish this! Thanks for sharing! So glad you liked the photos Savvy Sister 🙂 Totally amazes me too even though it’s more familiar to me culturally.